Fountain pens are regarded by many serious writers to be the best tools for writing or drawing with ink on paper. Quill pens were used since very early times as the preferred writing instrument. Documents from the Declaration of Independence and the U.S. Constitution were written with quill pens. The Quill fountain pen was responsible for a major transformation in writing and in the nature of paperwork during the 19th century. For the true devotee to quality writing instruments, this Quill Executive Width Fountain Pen is both functional and fashionable. 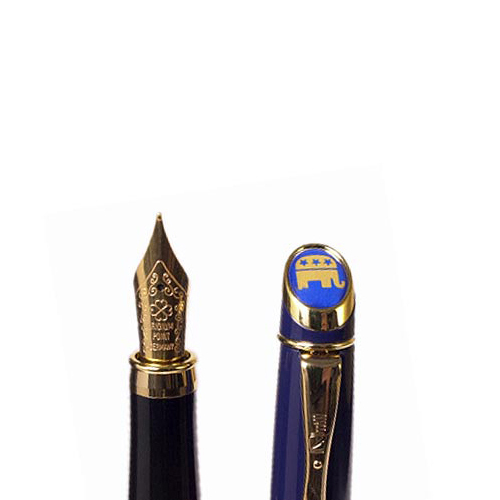 In cobalt blue with the gold RNC elephant emblem on the cap.